It’s not a secret that there is no love lost between Ray Allen and the rest of the Celtics’ 2008 championship team, including Paul Pierce. But deep down, you feel like there’s a chance Allen would show up for something like a jersey retirement ceremony for Pierce. Well, that isn’t the case. Instead of attending Pierce’s ceremony, he went golfing with George Lopez. Meanwhile, Rajon Rondo, Kevin Garnett, and even Doc Rivers made the ceremony. Why wouldn’t Allen show up to Pierce’s ceremony? There was a longstanding beef between Pierce and Allen that was supposedly squashed this summer in 2017. It stemmed from Allen leaving the Celtics and moving to the Heat in 2012. On Area 21 last May, Pierce and other Celtics expressed their displeasure with Allen’s choice years after the fact. “I was initially hurt by the whole way everything went down. ... 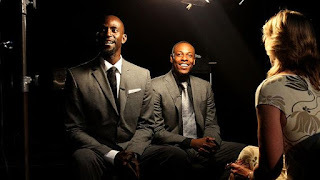 I just figured if it was me leaving, I would have [called each player and said] ‘this is what I’ve been thinking about,’” Pierce said during on Area 21. “That’s what I was hurt by when Ray didn’t at least give us a heads up about it. And then, to go to the team [that we were competing against.] I think I would have took it better if he just talked to us about it. But in September, the two got together and seemingly squashed things. They took a picture together, and Pierce’s Instagram caption talked about moving on from their past. So it’s weird not seeing Allen there despite the relationship between the two seemingly being repaired. Keep in mind, though, that him not being there doesn’t necessarily mean that things are not fine between the two. But you’d think that, if things were truly fine, Allen would show up to support a former teammate and Celtics legend. Hopefully things between Allen and Pierce are fine as they say they are. They accomplished something not many have together and, hopefully, we’ll see them come together and celebrate that in the future. 0 Response to "Ray Allen went golfing instead of going to Paul Pierce’s jersey retirement"